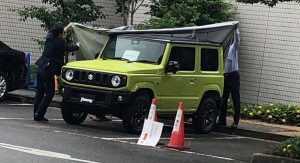 Forget about prototypes and renderings trying to solve the design ‘mystery’ behind the all-new Suzuki Jimny, because the small SUV has just been spotted without a trace of camouflage. 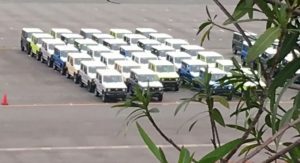 On top of that, there are multiple examples sitting together behind Suzuki’s factory, finished in a variety of shades, looking just about ready to be shipped to dealers all over the world. 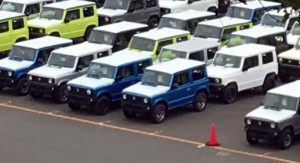 Also Watch: Suzuki Jimny Reviewed: Still A Good Buy Or Glad We’ll Say Goodbye? 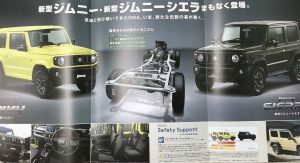 Beneath its boxy design lies a traditional ladder-on-frame chassis, which along with an all-wheel drive system should make the new Jimny a pretty capable small off-roader, going where no Nissan Juke would ever dare to go. 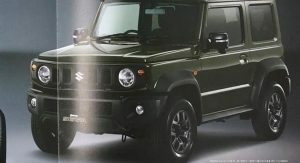 Overall, the upcoming Jimny seems happy to depart from conventional softened exterior designs. One might even call it retro-looking, which it actually is. 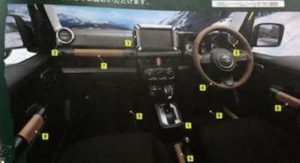 We can also tell that the new model still slightly resembles the old Jimny, with a table spoon of Mercedes G-Class and a pinch of Jeep Renegade. Its quirky, yet rugged appearance should definitely attract lots of fans, however it’s unlikely that such an unconventional design would ultimately lead to conventional sub-compact crossover sales numbers – something the Japanese automaker is probably at peace with. 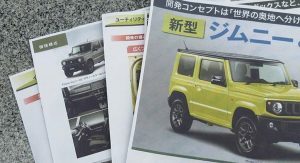 The all-new Jimny is also expected to feature some type of semi-autonomous braking technology (no Adaptive Cruise Control though) according to Creative311, as well as LED headlights. 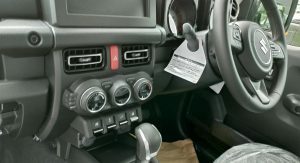 The cabin of the 2019 Suzuki Jimny, while it looks highly utilitarian, does gain modern-day features such as a touchscreen infotainment display, which looks just like the one in the Suzuki Swift. 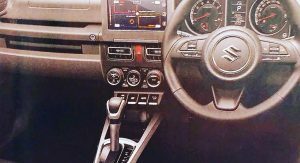 The interior image also reveals the presence of climate control, a multi-function steering wheel, an automatic transmission and not much else. 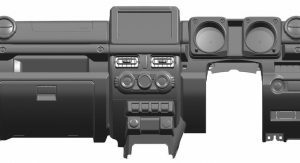 We did notice how some buttons are extremely large, probably so they can be easily operated while wearing gloves. 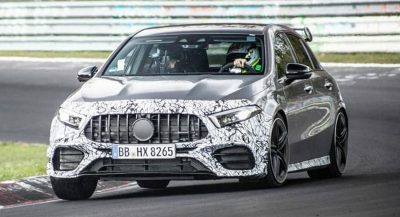 Power is expected to come from a base 1.2 liter naturally aspirated gasoline engine, while a 1.0-liter turbocharged ‘Boosterjet’ three-cylinder is believed to be a step up in some markets. The latter is rumored to have a maximum output of 110 HP, as well as 170 Nm (125 lb-ft) of torque. 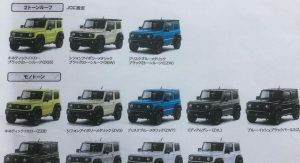 In the end, what these images tell us is that we’ll probably see the 2019 Jimny a lot sooner than initially expected, with a world debut to follow at the Tokyo Motor Show in October. 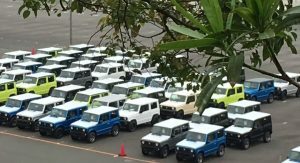 Sales will commence before the end of the year, while by the first quarter of 2019, the new Jimny should be available in different markets worldwide. The one with the white hood and roof looks pretty good…. 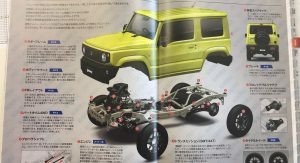 With Mercedes G looks, and a larger engine (2.0L? ), this would kill in the USA. 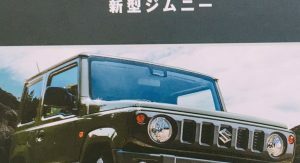 Missed opportunity for Suzuki with our crazy SUV fetish. Bo, you stoled my thoughts. 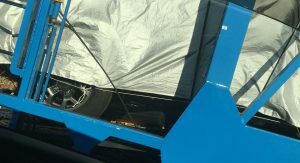 That’s a protective cover to stop bird crap damaging the paint. 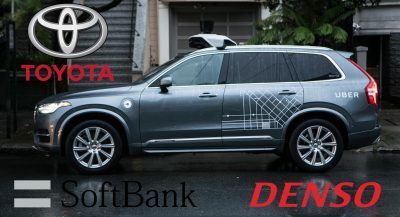 Now I personally feel as though this car would actually not do that bad on the American (Canada & The US) soil or within European nations as well. I actually think it does not look all that bad. Also (and maybe more importantly)…. please …. PLEASE tell me I am not alone here. 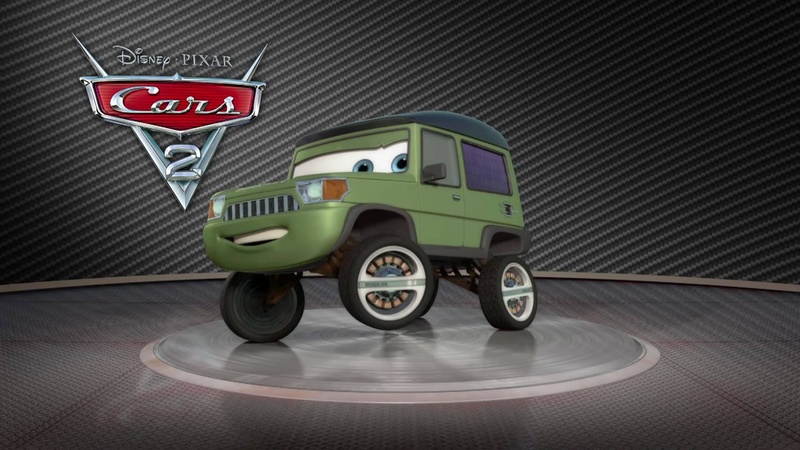 When I see a Suzuki Jimny, all I can imagine is “Sir Miles Axlerod” from Cars 2. I hope I’m not the only one who sees this (lol). it’s a little hard to unsee it now, Maybe it’s just the black roof. Let me know what you all think about this (also about the car being in American & European markets,.. because that’s important too (lol). ), I’d really love to hear what you’ve all got to say about this. I agree. 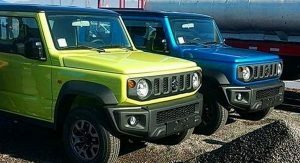 I think it is based on the Jimny, I think it’s sell pretty well here in the U.S. as well. 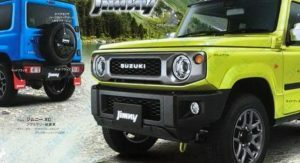 I keep reading the the Jimny as “Jimmy”. TBH Jimmy sounds better. I do like the Blue color. 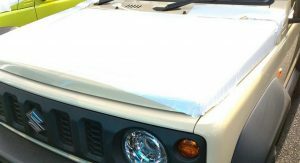 I grew up thinking it was Jimmy until I dated a girl that was coming from a mountain place and dreamed of having a Jimny. Might be a trademark issue. GMC had a “Jimmy” truck years ago. 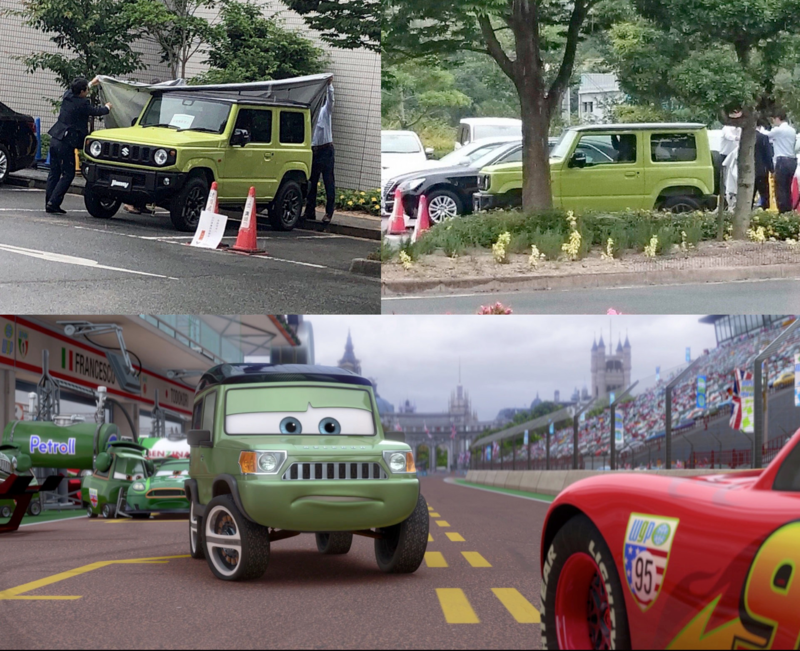 As far as I know Jimny is a result of mistranslation. 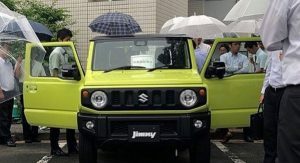 Suzuki executives were visiting Scotland when they decide to name it Jimmy, but when they are back in Japan, the message got translated wrong and we ended up as Jimny. No it’s not, find me evidence about it. What a great idea to have a 5 door version of it. Is that a dot matrix printer that they’re making that dashboard with? I don’t think that’s necessary… Just go buy one. I prefer the current shape, this seems too boxy and not in a bold way. Interior updates welcomed though. I think they went back to retro design, with Ignis who looks like Whizzkid, which actually looks good to me. I agree, looks like an old shoe box. I have to disagree…..the G-class on the other hand is still boxy so why? The current shape whitstood very well two decades and looks timeless even today. This next one was dated even when we were seeing only with camouflage. 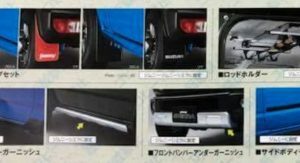 It makes a comeback to the rain gutters, something that we thought it was buried for good, specially considering that they worsen aerodynamics and add sharpen edges that turn a car more offensive in a collision. Looks like this kind of car should look. Rugged, simple, honest. You mean simple design is okay in this day and age? Simplicity is one of the main principles of good design. Looks far better than the current generation! 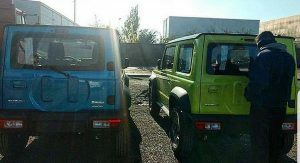 Love this update as it cannot be mistaken for anything other than a Jimny. 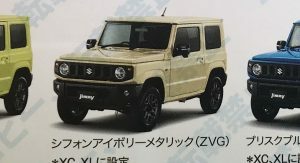 man if i was GM, I would try to get suzuki to let them sell the jimny here in the states, it would be a huge hit..
Well they need to replace the kei engine for sure, and federalize it, which would be really expensive and not to mention the reputation of Samurai before it. 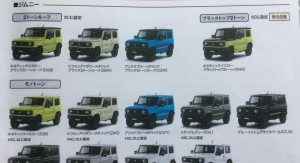 Those aren’t kei engines, they’re limited to 550 cc. and 1 liter and 1.2 liters are becoming more common in other parts of the world. 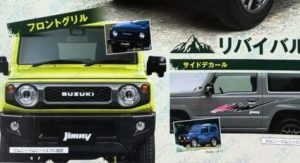 Wow it looks like original LJ80, I had to say the new Jimny is really good in the design. I hope the price would still be reasonable. Anyone have any Idea how much it’ll cost? 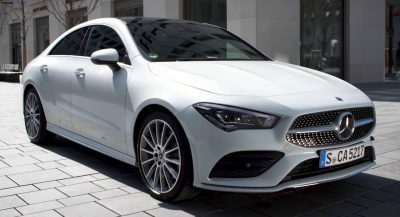 The previous generation model started at £12,000 (€13,640 / $16,070). I’m guessing the new one will come in at a little more! 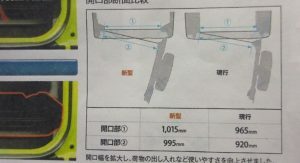 this design looks like “forword-back”!! 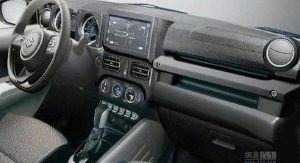 If this will have aftermarket parts support from 3rd party manufacturers like the Jeep Wrangler, it will become the new trend. I want one. I hope its cost stays low. 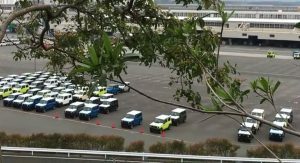 Toyota Batched Jimnys may hit states… If the deal between Toyota and Suzuki goes through. From what I understand that deal is for the Indian market only. So don’t get your hopes high. Add this to the North American Toyota lineup with the CH-R engine in standard all wheel drive form, and it will sell! 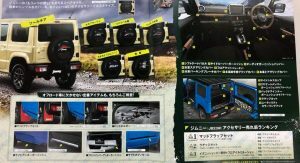 After all Toyota and Suzuki have a small partnership going and people still love the box design. It wishes it was a Jeep but it isnt. 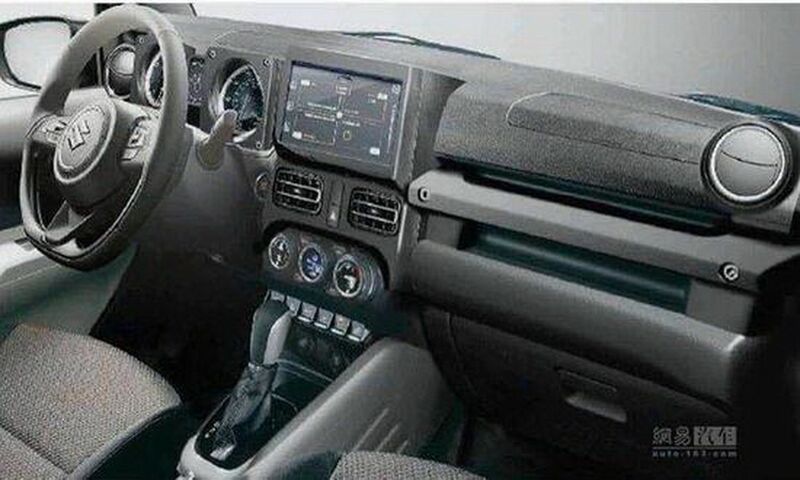 That steering wheel is a total Jeep ripoff, but not as up to date as the new Jeep one. 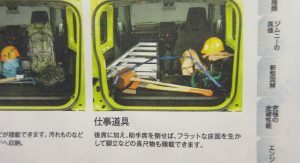 All the windows are flat; sensible economy there. I flipped one of the old versions of this and nearly died. Good times, good times! FCA should rebadge this as a Jeep. And call it Jeep Micro or something. 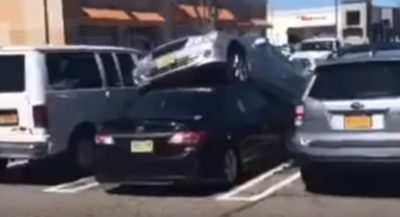 It’s either three or five mate, can’t be four for this type of a car. They’d need permission to produce under licence. That’s true. And it might be worth getting it. I am thinking it could hold maybe 11, possibly 12 clowns. Love the new shape. 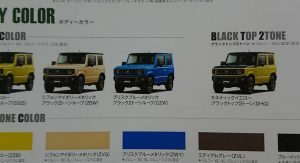 Looks like classy range rover defender. But why such a small engine? I have 2001 suzuki vitara 2L. Best thing I ever bought. Love her, love suzuki. 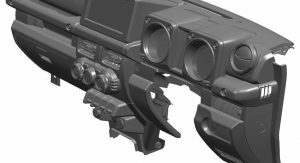 Hey look they re-released and updated the Samural….. For what it’s worth I had a ’91 Samurai and I loved it. It was fun to drive and contrary to a lot of reports was very stable. It could go almost anywhere. That’s exactly what happened. 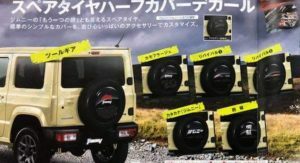 What we called the Samurai was called the Jimny in much of the rest of the world. Hope you can get one of the new ones if you want. Obviously needs decals and a convertible top. Last time I checked, she was in the history books and won’t be giving anything away but her unsold books. 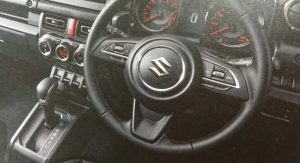 No thanks, Suzuki isn’t even a proper car brand it’s more of a motorcycle brand. 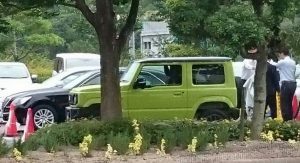 Looks like a cheap, Chinese Jeep knock-off. Really not innovative in design or anything. I fail to see the appeal.